Although we always try to minimize the impact of changes in our products and provide the highest quality support experience possible, the beta identifier indicated we were still refining the API and service behavior, and users should expect a sometimes significant evolution of the APIs and supporting services from release to release. Today, we’re dropping the “beta” label: Programmable Video’s Peer-to-Peer Rooms API is generally available. 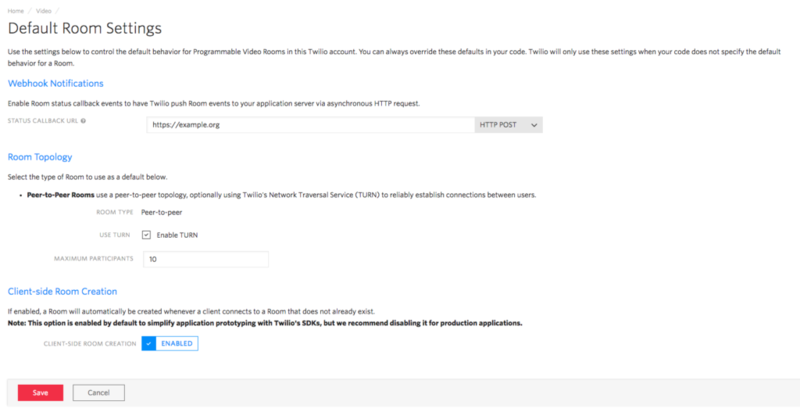 You’re encouraged to join hundreds of others in using Video in your production applications—we’ll provide the same top-notch support we provide for all generally available Twilio products. As just one example, the team at Doctor on Demand uses Programmable Video to help millions of users see a doctor at a moment’s notice. Patients initiate a video appointment with a doctor using the Doctor on Demand app for iOS or Android. The doctor uses Doctor on Demand’s web application to take the call and consult with the patient. Doctor on Demand originally used AddLive to power their video calling experience, but began looking for another vendor after Snapchat acquired AddLive. After they compared Twilio Video with the alternatives, it just made sense to go with Twilio. “We were already using Twilio for SMS appointment reminders, and we were really impressed once we tried out the Video SDKs,” said Kent Griffin, VP of Product at Doctor On Demand. “Video is a critical component in delivering a positive patient experience, and our customers are really enjoying the superior video quality we’re able to provide with Twilio. Today, we’re also announcing a new REST API that allows you to create and configure Programmable Video Rooms from your server-side code. Through this API you can create and complete Rooms, configure a Room’s TURN settings, set a URL to receive webhook status callbacks, control the maximum number of Room Participants, and more. Check out the REST API documentation to get started with the new Rooms REST API. The new REST API is great when you want to dynamically control Room configuration. Many applications, however, use the same settings for every Room. And sometimes, you want to be able to experiment with different options during development without having to make a REST API request each time. The new Default Room Settings page in the Video Console makes it easy to manage default Room behavior so you don’t have to make a REST API request every time. We’ll use the defaults you configure here whenever a new Room is created in your Twilio account, unless you override the defaults when creating a Room through the REST API. Another new feature, Room-based access control, gives you more control over the security of Programmable Video Rooms. Now, when you generate a client’s Access Token, you can add an optional room grant. The client that uses this token to connect to Programmable Video will only be allowed to connect to the exact Room you’ve specified in the grant. Check out our docs to learn more about Access Tokens and Room Access Control. In earlier releases of our Video SDK, your client-side code determined when a Room was created. But in some applications it makes sense to control the Room lifecycle from your server-side code. If this is the case in your application, you can now disable Client-side Room Creation in the Room Settings page in the Console. Any SDK client that holds a valid Access Token can create a new Video Room without you needing to first call the REST API. The client can specify the Room’s name, and if the Room doesn’t exist it will be created on-the-fly. A client’s Access Token must contain a video grant for a specific Room in order to connect. The Room must be pre-created with the REST API. Read the updated docs on User Identity & Access Control for more details. Before the REST API and Default Room Settings, Room configuration was governed by the Configuration Profile you set in your Video client’s Access Token. The Rooms REST API and Default Room Settings are simpler solutions, so we are deprecating support for multiple Configuration Profiles in favor of this REST API. Effective today, you can still view your existing Configuration Profiles, but you won’t be able to edit them or create new ones. Apps that use Configuration Profiles will continue working exactly as they do today until August 1, 2017. On August 1, 2017 we’ll remove Configuration Profile support from the Video product. On this date, the Default Room Settings configured in your account will be used for any Rooms that are not created through the REST API. Using an older release of the Video SDKs? If you’re using an earlier release of our Video SDKs, you’re likely wondering “How do these changes affect my app?”. If you’re using 1.0.0-beta1 or 1.0.0-preview1 or greater of our Video SDK, your application will continue to function without modification. All of the changes mentioned above are backwards compatible with earlier releases of our Video SDKs, and your app will continue working exactly as it does today. You only need to take note of the deprecation of Configuration Profiles on August 1, 2017 and make sure you have your Default Room Settings configured correctly. If you’re using a release of our Video Conversations SDK (releases older than 1.0.0-beta1 or 1.0.0-preview1), back-end support for these SDKs will be terminated on August 1, 2017. There are only a very small number of applications still using these early releases of our Video SDKs, so chances are you don’t need to worry. If you have any questions about any of these changes, don’t hesitate to reach out to our team at support@twilio.com. We’d be happy to give you a hand with any of your Programmable Video questions. MAJOR version when we make incompatible API changes. MINOR version when we add functionality in a backwards-compatible manner. PATCH version when we make backwards-compatible bug fixes. Additionally, we denote Developer Preview or Beta releases by appending -preview or -beta metadata to future releases. If you’re an iOS developer using CocoaPods, this also means you should now consume iOS SDK releases directly from the CocoaPods Master Spec Repository. Make sure you update your Podfile in order to keep up to date with future iOS releases. We believe that technical and consumer trends are making embedded, in-app voice & video a must-have capability for many applications. The global adoption of mobile devices means that we’re all carrying an incredible camera, microphone, and CPU in our pocket. Widespread support for WebRTC means that billions of people now use a video-capable browser to access the internet every single day. And increasing wireless network bandwidth and reliability makes it possible to bring high quality video to all kinds of environments that were previously unreachable. Every day, we see your applications validate these beliefs—and we’d love to see them in-person. Join us on May 24 and 25 in San Francisco at SIGNAL, Twilio’s annual developer conference, to network, learn, and meet the Programmable Video product and engineering team. Sign up here to receive 20% off SIGNAL registration (use the code Video20). We can’t thank you enough for participating in the Programmable Video Beta. We look forward to meeting you face-to-face, hearing your feedback, helping you with your app development, and sharing our roadmap. We can’t wait to see you what you’ll build with Programmable Video!